26 people were killed in Texas church shooting including the pastor's 14-year-old daughter. 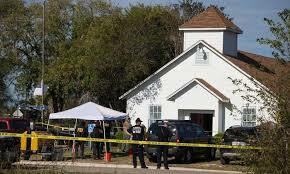 A man opened fire inside of a church in a small South Texas community of Sutherland Springs on Sunday. The gunman was shot and killed by a self-inflicted wound while being chased by police. The killer was identified as Devin Patrick Kelley age 26. It was the First Baptist Church of Sutherland Springs. Sherri Pomeroy, wife of Pastor Frank Pomeroy, said in a text message that she lost her daughter "and many friends" in the shooting. One hospital about 16 kilometres from the shooting says it was treating victims with gunshot wounds. U.S. President Donald Trump, who is in Japan, tweeted that he is watching the situation.